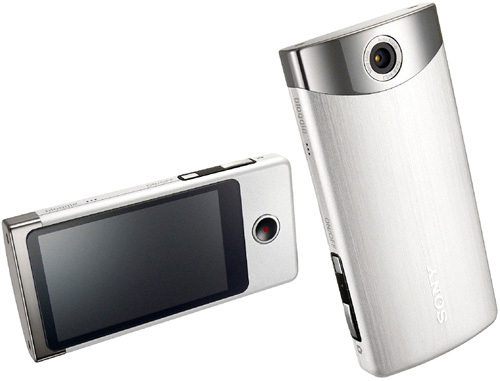 Sony Introduces Another Bloggie Model – The Bloggie Touch | OhGizmo! Sony’s Bloggie cameras were introduced at CES earlier this year, and while I wasn’t exactly blown away by the lowest-end PM5 model, I have to admit I was quite enamored with the slightly more capable CM5 with its optical zoom and flip out LCD. But here we are just 8 months later and Sony’s already introducing a third member to the Bloggie family with the Bloggie Touch. The most obvious upgrade over the previous two models is a 3-inch LCD touchscreen display and a new UI allowing you to ‘touch and flick’ your way through photo galleries and video clips. It’s got 8GB of internal memory in lieu of an SD card slot which is kind of limiting, and according to the Sony Europe press release that’s enough for about 4 hours of 720P video, in 29 minute chunks. Obviously at full 1920x1080P that will be considerably less. It’s also got the requisite flip-out USB connector for offloading photos (12MP) and clips, a much appreciated HDMI port and should be available by early November with pricing TBA. The most obvious upgrade over the previous two models is a 3-inch LCD touchscreen display .